After having MS Dhoni- An Untold Story, sports biography of past captain Mahendra Singh Dhoni is a big hit. The cricket fans should get ready for the man of the century Sachin Tendulkar to have his own feature. Sachin Tendulkar, who is a remarkable cricketer in the Indian cricket team has given the dates. Yes! 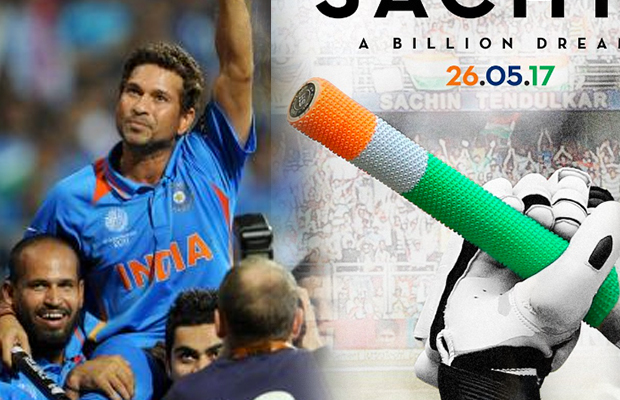 May 26, 2017 is the release date of Sachin- A billion Dreams (The movie). But unlike other biographic movies, Sachin Tendulkar himself is featuring in this movie. The movie also features his son Arjun Tendulkar. Himself starring as him in the movie, all eyes are excited to see Sachin on the big screen. We wish him luck for his big screen debut. Well, we have! Fans are now waiting for the trailer launch of the movie. Previous articleShah Rukh Khan Is Back On Television! Next articleWatch: Tiger Shroff’s Alleged Girlfriend Admits That People Used To Find Her Ugly!